In a rare occurrence, all three Super Bowl-winning Washington Redskins quarterbacks took the field at the same time. In the second annual Dare to C.A.R.E. 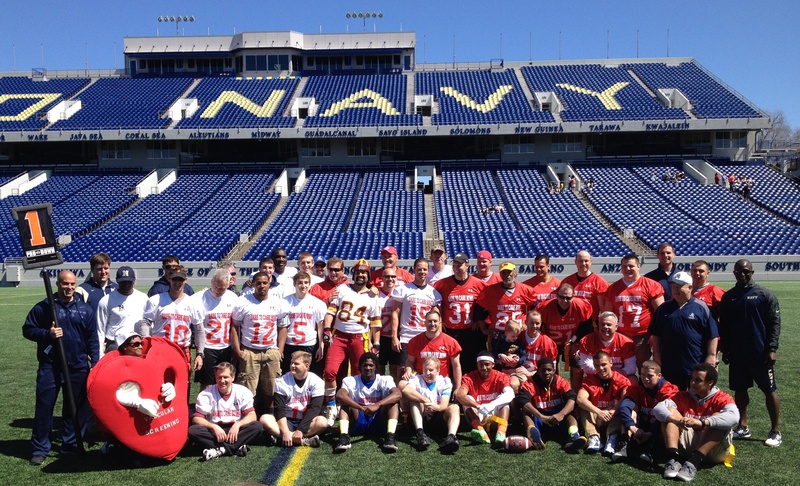 Bowl, Joe Theismann, Doug Williams and Mark Rypien took part in a flag football game at Navy-Marine Corps Memorial Stadium in Annapolis, Md. Fans were able to watch their heroes up close and personal after Theismann invited them to make their way down from the stands to the sidelines. After the game, fans enjoyed a VIP tailgate in the stadium’s N* Room with their favorite quarterbacks. All three men gave their opinion on raising heart health awareness, the addition of DeSean Jackson to the Redskins and what it will take for Robert Griffin III to improve on a lackluster 2013 season. For a full recap of the day’s events, visit my writeup for What’s Up? Magazine. Below are the interview transcripts from today’s event. Enjoy. Q: How did you find out about this event and how did you get involved? A: Actually, I’ve been involved with a Dare to C.A.R.E. free screenings and awareness about abdominal aortic aneurisms for about [six] years now. I started basically with a grass roots program where we got out to try to tell about what an abdominal aortic aneurism is. I got involved originally six years ago with my dad. My father was diagnosed with one. What it basically is is it’s a bulge in the artery that carries blood from the heart to the extremities and if that bursts, you basically have a 90 percent chance of dying. There’s free screenings that are available around the country where you can go in, have it checked to see if you do have an abdominal aortic aneurism, then you sit down and meet with your physician and decide the best course that you can take with regards to dealing with it. What we’re really trying to do is get people aware that this is a silent killer. people like Lucille Ball, Bob Dole, Albert Einstein, General [George] Patton — these are all people that were diagnosed with abdominal aortic aneurisms. Nobody talks about it but there are about a million people walking around with it and nobody really knows they have it. And then all of a sudden their heart, the aorta bursts and now you have a person who is in great risk. We’re just trying to get everybody aware of that. Q: What does it mean for you to be out here playing today? A: First of all, to be here at the Naval Academy, it’s such a great honor. I have such great respect and admiration for the men and women of our military. I had a nephew graduate from the Academy earlier this year so it’s just great to be out on this field. Notre Dame will play in FedEx Field against the Naval Academy so I’ll make sure I get to that game as well. You see in so many different stadiums around the country, what you see is you see people’s names in stadiums. Here, as you look around this hallowed ground, you see all the places that our Navy has had a presence in protecting our interests and our country and everybody in this country. It’s very heartwarming to see. Q: What is your take on the DeSean Jackson signing? A: I like it. I like DeSean. I like the fact that DeSean is here. For anybody to think that the Redskins didn’t do their due diligence when it comes to concerning what DeSean can bring to the team – wide receiver was one of the sorely needed areas of the football team. Our special teams were horrific but our wide receivers were basically invisible. You couple that with Robert [Griffin III] coming back off an injury and not really having a chance to work out, now you’ve added speed with Robert’s and DeSean. Pierre [Garçon] should be back strong, Alfred [Morris] is always Alfred. Add some help to the offensive line. I like the addition of DeSean Jackson. Just his speed alone on the field changes what people should try and do against the Redskins, who had a very dynamic running game anyway. And as far as off the field goes, like I said, I trust the Redskins did their due diligence. He’s never been in trouble with the law. There’s a lot of other guys that have had issues in the National Football League that I guess you say weren’t quite the citizens that he was and he’s a good one. Whatever went on in Philadelphia, I do know this that if I’m DeSean Jackson and I have this opportunity to come to the Washington Redskins in the division, I’m going to be a very inspired individual because people have said things about me and I’m going to do everything I can to let them know that number one, I’m not that type of person and secondly, that last year was a great year — nine touchdowns and 1,300 plus yards — that the contribution he can make with the receiving corps that the Redskins have right now I think can be, maybe the numbers won’t be the same but I guarantee you the impact will be. Q: As a quarterback, you now have a lot of weapons if you’re Robert Griffin III. How do you take care of [and] massage the egos knowing there’s not enough balls to go around for one guy and you’ve got to spread it out? A: What you have to do is you have to make sure right in the beginning that everybody understands that there’s a certain amount of balls that are going to be distributed. You can’t forget Jordan Reed, who’s another great presence. You got Pierre, Jordan Reed, Andre Roberts, DeSean Jackson. Where do you go with the football? That’s going to be [Redskins head coach] Jay Gruden and [Redskins offensive coordinator Sean’s [McVay] challenge to be able to figure out how you distribute it. The most important thing for the Washington Redskins this year is they understand that there’s a lot of people that have the capability of changing the complexion of a game. You don’t know when it’s going to be your turn but you have to be ready when your turn comes. It’s gotta have to be a very unselfish group of wide receivers and I believe that will happen. This is a big year for Robert, too, because it’s the last year of an opportunity in his rookie contract to be able to capitalize on something going forward as well. When you look at this football team, there’s a lot of upside, I think, for the Washington Redskins. Q: It’s not often that all three of you are out on the same field. Last year was pretty good with Doug [Williams] and Roger [Staubach]. Now they’ve upped the ante with three Super Bowl winning quarterbacks. This is a pretty special event. A: There aren’t too many teams that have the opportunity that we have. We’ve had three MVP’s with Larry Brown, Mark and myself and of course with Ryp and Doug here, having the opportunity to win one myself, the Redskins are still a very unique organization in that regard. [Mark and Doug] are two of the greatest guys. Ryp was downtown earlier this week working on some stuff. Doug’s in the organization now. And you know me, I’m sort of around all the time. I’m like a bad pimple that just won’t go away. There isn’t enough Clearasil to get me cleared up. It’s great to be with them. I have so much respect for them. They’ve done so much. They’re great citizens as Washington Redskins, great citizens of this city. To be involved here with our Dare [to] C.A.R.E. event program – Dr. John Martin really came up with this to promote abdominal aortic aneurism health and screenings. I’ve been involved for six years. My dad was diagnosed with an abdominal aortic aneurism and that’s how I really wound up getting involved. For me, we’ve laid sort of the grassroots of what the program’s about. Now we want more and more people to understand that screening is important, that it is something that can be diagnosed. Early prevention, I think, leads to greater health in life. If there is a problem, you get a chance to sit down with your doctor and consult the options that are available. But really, you just have to understand that there is a thing called abdominal aortic aneurisms. It’s a silent killer. There are over a million people out there walking around that actually have one and don’t even know it. So that’s why the screenings are so important. Q: You had great receivers when you played, [the Redskins] just added DeSean Jackson. When you see that come across the headlines, what do you think? A: I know when people see 11 running down the field, they’re going to think a lot about me. [Laughs] I think this is a new lease on his second opportunity to be a great pro. I know he’s going to take full advantage of this. If he doesn’t, that’s up to him. He’s a great talent. From what I heard, he’s not that bad a kid. He can answer the naysayers by doing what he does on the field and off the field. That’s as important what we did off the field as it was what we did on the field. I think that era of football, before free agency, you got entrenched in this community and you felt very good about what you did here with your teammates and what you did with the Redskins fans and the community in general. Q: What do you think it will take for Robert [Griffin III] to have a bounce-back season? A: I think he wasn’t fully himself. I think another year of healing — a torn ACL is a serious injury, you know. I’ve had a meniscus removed and I came back earlier than I wanted to. I was half the player I was, half as mobile as I was before. You could see that he was not himself and I think another year under his belt and having the weapons that he has, I think it’s going to be a great thing. Q: Tell me about your day and how fun it was for you to be out here on this field. A: I had a great day. The most important thing is not the fact that I’m on the field playing but playing with these guys who are here for a cause for the Heart Health Foundation. They’re all out here. They gave of themselves. They gave their money to support a great cause that the Heart Health Foundation is doing and I think that’s the most important thing. Q: How much does this foundation mean to you and just coming back here? You were here last year and made it out a second year. A: It’s personal because I’ve got an older brother who had to go through some heart procedures so I understand what it’s all about especially being an African-American. [It’s the] number one killer in our community. I think it’s very important that you provide free screenings for people who can’t provide for themselves. Q: Aside from this event, what other events do you take part in to promote this kind of awareness? A: I do a lot of radio and TV ads for them. Dr. John Martin is a great guy so it’s good to be a part of it. Q: What was your role in getting DeSean Jackson to the Redskins and what was your initial reaction when he was released? A: When you talk about your role, number one, Bruce Allen, who’s the general manager made the initial contact and it’s our job to provide information. I got a chance to talk to him. He met with everybody in the building. Everybody was trying to get a feel for who he is and the kind of guy that he is. I think everybody feels pretty good about DeSean Jackson being a Redskin. Q: What’s your initial impression personally of what you’ve heard of him and seen of him and communicated with him so far? A: I had a chance to meet him before he got drafted by Philadelphia when I was in Tampa. The first thing he did was he found me down the hall, we shut the door and had a good heart-to-heart talk. I think what happened to him, he’s still kind of confused as to who said what or what have you but I told him that wasn’t important now. The most important thing is going forward and being a good teammate for us. Q: So what is your initial plan for him right now? Is it to be the number one receiver? A: I don’t handle that. That’s particular for Jay Gruden. I don’t do that part. That’s the coaching aspect of it. Q: What do you think is the biggest key for Robert Griffin III to have a comeback season? He obviously had a great rookie season, took the whole league by storm and last year struggled a lot and was deactivated the final three games. A: I think number one, what we’ve got to realize is that no matter who Robert Griffin is, whether it was Robert Griffin, me, Mark Rypien or Joe [Theismann], the most important thing is the people around him. I think that’s our job now and we’re trying to do that [and] put enough people around him that will make him the quarterback that he’s capable of being. Q: How much better is this team now since before free agency started? Have you guys executed the plan you wanted to so far? A: I wasn’t here last year but I can honestly say that I’m sure that this football team is a lot better than what it was last year. That was the number one thing is to make sure we were better than last year and I think we’ve achieved that. We’ve still got a little work to do because all the guys that we’ve brought in here you’ve still got to mesh them together and make everything happen. Q: What are you most pleased about with your offseason plan to this point? A: I think after free agency a lot of people wanted you to do this and do that but I think when you look at the people that we signed that were already on this football team and the guys that we brought in here, I think you would have to say that we have had a pretty successful offseason. Q: How did you feel out there playing today? A: I don’t feel it right now but I will tomorrow. It’s fun because of what we’re playing for. And you see so many people give their money and time its kind of like a donation for people who can’t afford to get screenings. And for myself, Joe and Mark to be out here and to give back, I think that’s what it’s all about.